In March 2013 a Memorandum of Understanding was signed between I-Systems College, Malaysia and London South Bank University. Our partnership with I-Systems College aims to promote educational courses for the mutual benefit of both parties, in particular the development of nurse education. I-Systems College is a private organisation with six colleges throughout Malaysia. I-Systems College, Kuching, has delivered Diploma in Nursing programmes since December 2008. On 17 September 2013 we had the successful validation of our two new nursing courses, one is a two year course for post-registration nurses and the other a four year pre-registration course. This successful validation was a result of the close working between our Faculty staff and the senior staff in Kuching. Adrian Hon, Principal and Sophia Lee, Head of Nursing) from I-Systems Kuching, joined us at LSBU and gave valuable assistance at the validation event. Adrian and Sophia spent the week with us viewing the teaching facilities in the Faculty and taking part in key discussions on how the courses will be delivered. 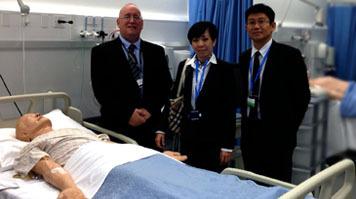 The partnership also has the full support of the I-Systems chief executive Dato John Tiong who has been involved in all of the discussions regarding the delivery of these courses and is overseeing the construction of a new campus building alongside the existing I-Systems College to ensure students enjoy the best facilities. These new courses are required to meet not only the QAA guidelines but also those of the Nursing Board Malaysia, the Ministry of Higher Education, Malaysia and the Malaysian Qualifications Agency. In December, LSBU will visit Kuching with the aim of entering into a formal collaboration to deliver these new programmes in September 2014.